Heavy-duty tubular, carbon steel frame construction for strength and durability. Unit is designed for a 4,000# maximum capacity. Frame height is adjustable for flexibility with future applications. Carbon steel sandblasted near white, then painted MTS Blue using PPG Durethane finishing system. Stainless steel fill head includes 4” diameter outer dust control sleeve with filter sock. Food grade inflatable spout seal assures a dust tight seal to bag inlet. The inflation control is provided with automatic or manual functions. Fill head includes an integral bag inflation system with air amplifier system and a 4” diameter actuated butterfly valve. 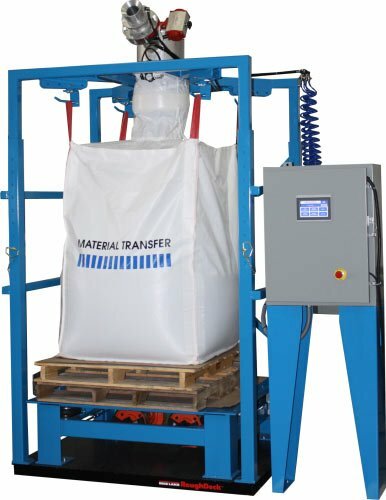 Manually adjustable drive off bag hangers for efficient bag removal after completed filling sequence. Heavy-duty flat top densification system with twin electric vibrators and pallet retaining angles. Gain-in-weight carbon steel platform scale system with black alloy steel load cells. Remote mounted NEMA 4 control enclosure with Allen-Bradley Mirco820 PLC system. Allen-Bradley PanelView 800 operator interface provides easy access to system status, recipes, and operational parameters.